Behavior charts! Behavior charts can be an effective way to improve a child's behavior. 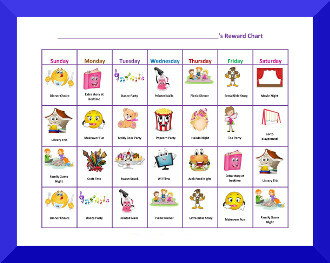 Behavior charts can be used to eliminate difficult behavior or track daily tasks and routines. Don't forget to relax and have fun when using behavior charts! Below you will find some of our behavior chart themes. We also have a complete list of our behavior chart categories on our Behavior Chart List page. And if you'd like to search for a chart by character, visit our Behavior Chart Character page! Before you start, read our article on How to Use Behavior Charts for Kids and How to Motivate Kids with Behavior Charts. We also have some Examples so you can see a demonstration of how to use behavior charts. And don't forget to check out some great reward ideas! We are happy to add more categories based on your recommendations. Feel free to let us know! Also check out our Behavior Charts without Popular Characters.